Flare is not the same as flair, so don’t use one when you mean the other. The sleeve of the gown was a graceful flare, trimmed with gold embroidery at the open end. Janet has a flair for mathematical puzzles. The final entry in the show was presented with even more flair than the ones that preceded it. It’s up at all the usual places. In a sane and rational world, it shouldn’t be necessary to state for the record that I thoroughly disapprove of alt-right supporters neo-Nazis white-supremacists dirtbag racist whackaloons holding torchlit rallies, chanting racist slogans, beating up counterprotesters, and ramming cars into crowds of people with murderous intent. It would be the sort of thing that any person of normal intelligence and good will should be presumed to be against until proven otherwise. But that’s not the world we live in, so . . . let it be known that I thoroughly disapprove of all of the above things. Congratulations to everyone I know and like who got a Hugo! And congratulations to everyone whom I don’t know personally, but still like, who got a Hugo! Looking over the results, I don’t think there’s anybody whom I know well enough to dislike who did get a Hugo (unlike some years past), so that’s good, too. It’s nice to see that science fiction’s signature award is still doing well. 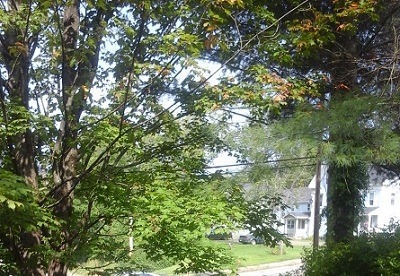 That tree in the front driveway that I was talking about the other day is now showing its first patch of color. Summer is now officially (for local household values of “official”) transitioning into autumn. We have also recently taken in our first batch of gift zucchini. Likewise a couple of locally-grown tomatoes, which promptly went into BLT sandwiches. Raising tomatoes up here in northern New England is a triumph of hope over experience every time; they have to be started indoors, and once they’re out in the garden, it’s a race between them and the first frost. Our printer died the other day, somewhat to our surprise. It was an HP Deskjet 6940 — in other words, a fairly sturdy office model — and it really shouldn’t have reacted so badly to having been taken for a car ride to Peabody, Massachusetts, and back again. But react badly it did; once reconnected to our household setup, it steadfastly refused to communicate with the desktop computer. We did all the usual things to confirm its defunct state: We switched in a known good USB cable, to make certain it wasn’t the cable, and it didn’t work; we switched in an old but working college printer left behind by one of our various offspring, and it did work, to the extent that it would install and communicate with the desktop computer (it had paper take-up issues, and its ink cartridges were several years old, so it wasn’t good for anything other than diagnostic purposes); we ran all the troubleshooters and checked for updated drivers; all to no avail. It was time, we admitted, to go printer shopping, and so we did. I wound up ordering a refurbished Kodak Verite 55 from New Egg; I’ve had good luck with their refurbished stuff before. Also, the printer in question was on sale that week for $34.99, which meant that even if it turned out to be a dud, I wouldn’t be weeping hot tears over its demise. Nor would I feel unduly guilty if we decided at some more wealthy point to upgrade to a more expensive model. The printer in question is low-end enough that by the time we’ve gone through a couple of replacement ink cartridges, we’ll have spent more on ink than on the machine itself. (It’s the “don’t make your money selling razors; make your money selling razor blades” principle, I suppose.) But it doesn’t matter. We don’t actually need an iron-thewed workhorse of an office printer that can do 600-plus pages in an afternoon without breaking down, because it’s been over a decade since we last submitted a novel in hardcopy form. It’s all electronic now, and I don’t miss it a bit — not the wrestling with a stack of loose paper that wants to slump over into an uncollated pile; not the necessity of keeping an eagle eye on the printing process to make certain that no blank pages or skipped pages get through; not the wrestling with paper jams or the inevitable discovery at page 550 that you’re out of ink and the nearest Staples is an hour and a half away and already closed for the night. Other people can wax nostalgic over their old-school office-quality printers†, or their IBM Selectrics or their Smith-Coronas, or their one true fountain pen, or their perfectly-trimmed goose quill, but not me. In this case, at least, technology is my friend. †Okay, I’ll admit to looking back at my first Epson MX-80 dot-matrix with fond remembrance; that printer was built like a tank, and survived both a transcontinental move and an international move without failing, and was our printer of choice for first drafts for a long time after that.